Aqueon QuietFlow Power Filters and cartridges were designed with the fish and the aquarist in mind. Our patented designs include unique features to enhance water quality and clarity, increase oxygen levels and lessen noise. Aqueon QuietFlow Power Filters feature four stages of filtration-mechanical, chemical, biological and wet/dry-for the cleanest, clearest, healthiest water. Higher flow rates ensure higher dissolved oxygen content for healthier, more active fish. The internal pump design helps dampen noise, eliminates leaks and starts up automatically after cleaning or power interruptions. Aqueon QuietFlowÂ Power Filters feature four stages of filtration â€“ mechanical, chemical, biological and wet/dry â€“ for the cleanest, clearest, healthiest water. Higher flow rates ensure higher dissolved oxygen content for healthier, more active fish. The internal pump design helps dampen noise, eliminates leaks and starts up automatically after cleaning or power interruptions. Aqueon filters have higher flow rates than the competition to ensure proper turnover for cleaner water and higher dissolved oxygen content, making fish healthier and more active. The patented biological grid has a large surface area to support more of the beneficial bacteria that eliminates ammonia and nitrates. A second wet/dry grid provides further biological filtration and oxygenation as the water returns to the aquarium. 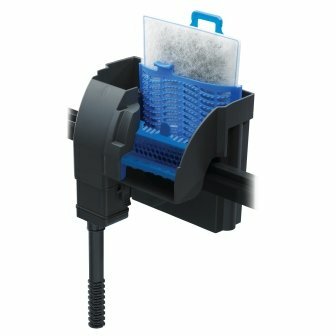 Since the filter pump is submersed in the aquarium, there is no need for priming at setup or when restarting the filter after cleaning or power interruptions. An internal pump also allows for virtually silent operation, continuous flow raters, less chance for leaks, and a much thinner profile. Stage 1: Dense floss removes particles and debris. Stage 2: Activated carbon removes toxins, odors and discoloration. Stage 3: Patented Bio-Holster removes toxic ammonia and nitrites. Stage 4: Diffuser grid removes additional toxins while adding oxygen for more active fish. It also reduces splashing makes the return exceptionally quiet. Pioneer Pet studies animal behavior and animal needs closely. Moving water attracts pets, encouraging them to drink often to stay hydrated & healthy. A charcoal filter will help remove odors and keep the cat or dog's drinking water clean and fresh. Routine maintenance of replacement filters will extend the life of a pet fountain. Change the filter every two to four weeks, depending on the number of animals using the fountain. Pet fountains help your animals to drink more water because they are attracted to moving water. In the past the only option you had for an automatic pet fountain was a plastic one. Now finally there is a stainless steel pet fountain that looks like it belongs in your kitchen. Our stainless steel drinking fountain is extremely easy to take a part and clean. It is 100% dishwasher safe and is made from high grade stainless steel. There has never been a fountain that looks or works as well as this one does Drinking Fountain Big Maxâ„¢ by Pioneer Pet Moving water attracts pets, encouraging them to drink to stay hydrated & healthy. The ultra-quiet pump circulates and oxygenates the water. With its huge drinking area, the Big Max Drinking Fountain will suit most dogs or multiple cats. Made from stainless steel, this pet fountain holds over a gallon of water. Winner of the 2011 Industry Recognition Awards, Pet Business. Product Features & Benefits Water flow continuously washes the bowl for maximum cleanliness. Premium Stainless Steel. Capacity: 128 oz. (3.78L) Product Dimensions: 4 Â¼â€ H x 12â€ W x 13.75â€ L Product Weight: 3.2 lbs. Premium replaceable charcoal filter for clean & pure, healthy water. Patent pending design holds filter and electric pump. Safe, low voltage UL listed power system. 6â€™(1.82m) long power cord. Easy cleaning, dishwasher safe. The Penn Plax Cascade 1000 Canister Aquarium Filter is a heavy-duty external filtration system. The Cascade 1000 (CCF3UL) is for aquariums up to 100 gallons and pumps 265 gallons per hour (GPH). Delivering powerful mechanical, chemical, and biological filtration, which produces crystal clear water in both fresh and marine aquariums. 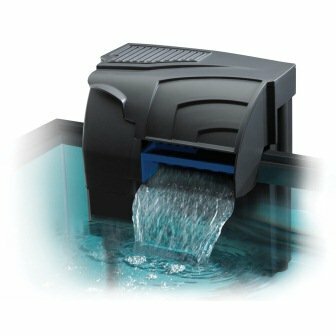 Crystal Clear Water for Fresh and Marine Aquariums: The Cascade Advantage! 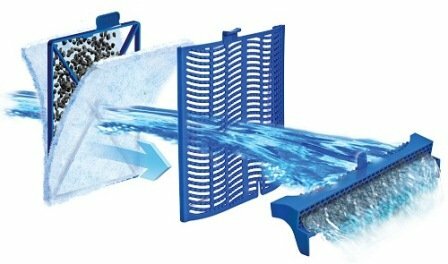 The floss pad removes fine particulate matter, while the activated carbon media removes toxins and impurities from the water, leaving a cleaner and healthier environment for your fish and other aquatic life. The coarse sponge makes for an abundant surface area for proper biological filtration by promoting bacterial growth to effectively remove waste, excess food and harmful ammonia and nitrates. This durable aquarium filter is equipped with quick-disconnect tubing connectors that can also be utilized to control the filter's flow rate. 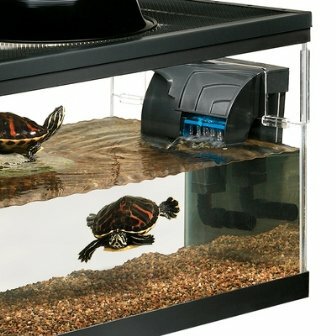 To ensure a secure and water-tight fit, this dynamic fish tank filter utilizes four locking clamps along with a motorhead equipped with an integrated O-ring. Filter media is included free with each canister filter. The legendary classic filter with tried and tested technology and high level of efficiency - even for larger systems. The mechanical-biological purification is achieved in a single process with constant water circulation and simultaneous oxygen enrichment. The 2213 model comes complete with Filter insert for easy cleaning. For any quires, contact: 1-888-343-4668. Top Level Categories for Aqueon 06117 QuietFlow 50 Power Filter, 250-GPH.